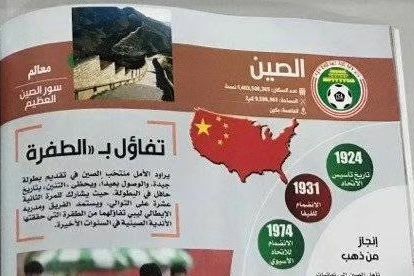 The Chinese Football Association (CFA) protested over a brochure distributed during the opening ceremony of this year's Asia Cup in Abu Dhabi that wrongly contained a map of the US to represent China. The brochure lacked the "permission or approval of both the Local Organizing Committee (LOC) and the Asian Football Confederation (AFC)," the AFC said. Photos showing "China's map featured an outline of a map of the US but did not show Alaska and Hawaii" went viral on Sunday. It was first posted by on Sina Weibo by a user nicknamed "R Luoke." "It was a photo taken by a frontline reporter," "R Luoke" told the Global Times. Many Weibo users joked the brochure has "turned the US into Chinese territory." Another Weibo user wrote sarcastically: "Editorial office: Sorry, we made a mistake and next time we will not forget the State of Alaska and Hawaii." The mixed-up map triggered the anger of Chinese officials. The CFA said on its official Weibo account on Sunday night that it immediately made solemn representation to the Asian Football Confederation (AFC) and the Local Organizing Committee (LOC). The CFA said the brochure was printed by a local news agency and it was not released by AFC. In a statement released on its official Sina Weibo account on Sunday night, the AFC said it has been made aware a magazine had published the map without the permission of either the LOC or AFC. "We have contracted the publishers, an independent newspaper, to register your disappoint at the errors," said the AFC. Along with making mistakes on several details of China's national team, the handbook also printed plenty of mistakes about East-Asian teams. A feature on Keisuke Honda, who was not ever part of the Japanese team, was printed on a page of key Japanese players. The introduction of the Korean team contained a photo of the Korean Superstar Son Heung-min crying. Despite the controversy, the 2019 AFC Asian Cup opened on Saturday and was trumpeted by the AFC as the "Biggest-ever AFC Asian Cup."